I though that my hunger for sushi could never be fulfilled… well, that was until I took a seat in Super Sushi! Price: Cheap (65 SEK each). 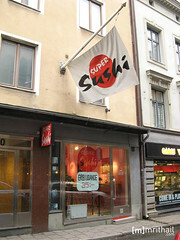 Super Sushi is placed very close to the most touristic part of Göteborg, and it’s very easy to locate thanks to the huge flag the have on the entrance. The restaurant is very small and its decoration is not fashionable. The tables are placed very close to each other, trying to be able to locate the maximum people in the minimum space. However, I don’t see that as a drawback, because, after all, the main purpose of Super Sushi is to be a take away place, not a seating restaurant. The menu is everything but wide. It only has 4 standard menus and 4 lunch menus, which are served between 11:00 and 15:00. 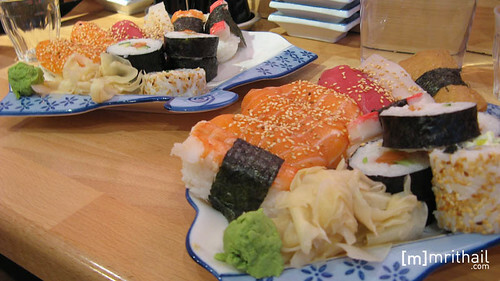 The standard menus simply are predefined sets of sushi of 7 pieces (55 SEK), 9 pieces (65 SEK), 12 pieces (75 SEK) or 15 pieces (99 SEK). 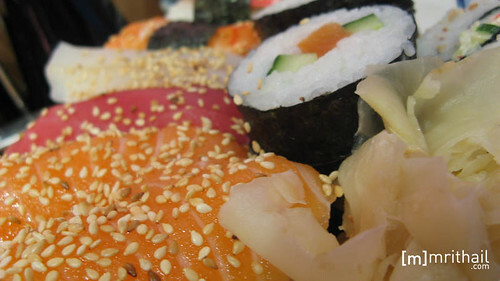 The lunch menus consist on a set of sushi of 8 pieces (53 SEK), 11 pieces (63 SEK), 4 pieces of yakitori (60 SEK) or 8 pieces of inside-out roll (55 SEK). Every menu includes miso soup. We ordered a standard menu of 15 pieces and a lunch menu of 11 pieces. The first thing that astonished us was that the size of each piece was almost the double the size of the biggest piece we’ve ever found in any other sushi restaurant. In fact, we saw that all the people who ate there, had knifes to be able to cut the pieces by half. So it’s almost as if each menu has the double amount of pieces!. Really, they were huge… unfortunately I didn’t took any pic with a reference object :S. Almost all the nigiris were delicious; the only exceptions were the red tuna nigiri (usually my favorite), which was just regular, and the crab one, which was just bad. The maki were ok, but the best pieces in the set were the uramakis, very juicy and tasty. A detail I liked is that they ask you if you want wasabi and pickled ginger with your sushi. Also, they offer to top your sushi pieces with sesame seeds, and they’re very generous with the amount of wasabi, ginger and sesame seeds they give you. And you serve yourself the miso soup, being able to refill your bowl if you want. Despite the size of the restaurant, the impossibility to choose your own menu or even to order a pair of nigiris of your choice, I must say that I really loved this place, and that I’m really looking forward to go back there. In fact, I still regret not having ordered a set to eat it in the train the last day. But next time I won’t do the same error. Also, I’d like to comment that in that same street there are about 3 or 4 sushi bar and Japanese retaurants, so if you don’t like the place when you arrive, or if it´s overcrowded, you can always choose another option ^^. göteborg is such a wonderful city… and this place is awesome!! the rice is very tasty and the pieces are huge! How I did miss this restaurant while I was in Göteborg? Damn! Shaka: Well, with the amount of sushi bars in that area, the hard part is to choose only one. I’m sure you did’t ate here, but in other place as good as this one! Desde luego no voy a morirme de hambre, jeje. Carlos, you could have choosed your own mix of nigiri, maki or urumaki. I’m a frequent visitor at this place and mix my menu all the time, even the cheaper lunch menus. A friend of mine, big and hungry all the time, went so far as ordering 11 salmon-nigiri, no problem for the staff. Though, for my taste I’ve had better miso-soups elsewhere. I didn’t know about that, thank you very much for the tip, borealis.